The Lung Interstitium. History and Examination. Investigations. Bronchoscopy and Biopsy. General Principles of Diagnosis and Management. Idiopathic Pulmonary Fibrosis (IPF): Background. IPF: Diagnosis. IPF: Management. Hypersensitivity Pneumonitis. Nonspecific Interstitial Pneumonia (NSIP). Cryptogenic Organising Pneumonia. Connective Tissue Related ILD. Sarcoidosis. Smoking Related ILD. Complications of ILD. ILD in Critical Care. 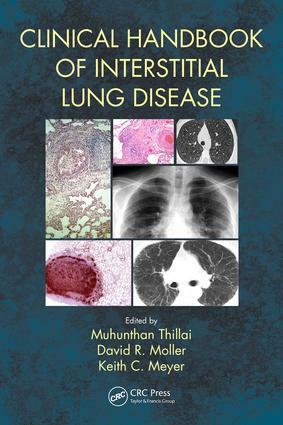 Muhunthan Thillai, MBBS, MRCP, PhD is Consultant Physician specialising in Interstitial Lung Diseases at Papworth & Cambridge University Hospitals in the United Kingdom. He graduated from St. Mary’s medical school in 2002 with his medical degree and a BA in medical journalism. He began his training as a junior doctor in London and Oxford where he gained Membership of the Royal College of Physicians. He was then appointed as the Infectious Diseases Fellow on the Map of Medicine project at NHS Connecting for Health and as Editor-in-Chief of Junior Dr magazine, before being awarded a personal Research Training Fellowship from the Wellcome Trust. This allowed him to undertake three years of scientific research into sarcoidosis which culminated in a PhD in Immunology and Proteomics from Imperial College London. He continued his medical training in lung cancer, pulmonary vascular disorders and lung transplantation in Papworth and then in respiratory and general medicine at Addenbrooke’s Hospital. He subsequently completed an observership in sarcoidosis at the Cleveland Center in the USA before being appointed in 2015 as a Consultant within the Papworth Interstitial Lung Diseases Unit with a specific interest in sarcoidosis. He continues to attend a regular outpatient clinic at Addenbrooke’s Hospital and maintains ongoing research links with Imperial College London. He has been awarded a number of clinical and research prizes from societies including the Eastern Thoracic Society, Imperial College London and the National Heart and Lung Institute. He is the editor of five books, has written numerous book chapters and research papers in sarcoidosis and has given presentations at several international scientific meetings. Nik Hirani, BMedSci, BMBS, PhD, MRCP is Senior Clinical Lecturer and Honorary Consultant Physician within the School of Clinical Sciences at the University of Edinburgh in the United Kingdom. He is also Principal Investigator in the research group studying “Human Models of Inflammation” at the MRC Centre for Inflammation Research. The aims of this group are to study the manipulation of oxygen-sensitive mediators to modify acute lung injury and repair as well as clinical and translational studies in idiopathic pulmonary fibrosis. David R. Moller, MD is Professor of Medicine at the Johns Hopkins Asthma and Allergy Center, the Johns Hopkins University Hospital in Baltimore, Maryland, USA. He is recognized as a top researcher and clinician in sarcoidosis and has published widely in this area.